If you like pesto, you'll love this pesto pizza recipe! It's an easy pizza sauce recipe and it's very delicious. Make this pizza sauce and see for yourself. This recipe is strictly veggie, but you can easily add chicken for a meatier pesto pizza. You can also experiment with making your own pesto. Or use prepared...whichever you prefer. 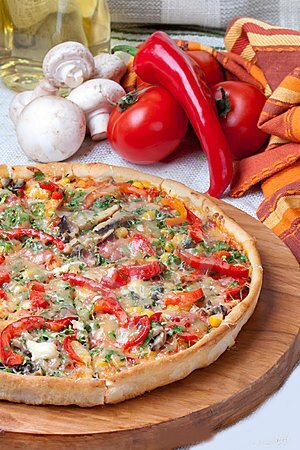 Also try adding slices of tomato and olives for a Mediterranean pizza recipe! Add onions, peppers and mushrooms to skillet and saute until tender. Remove them from the heat. Spread the pesto sauce over your choice of crust. Top with your favorite veggie mixture and different cheeses. Bake according to crust directions (usually about 8-10 minutes in 450 oven).